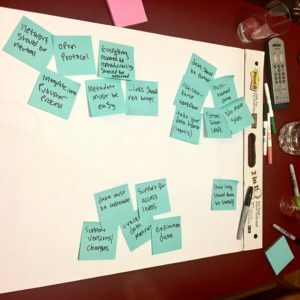 The UC Berkeley Library and the California Digital Library are investigating researchers perceptions, values, and behaviors around the software generated as part of the research process. If you are a researcher, we would appreciate if you could help us understand your current practices related to software and code by spending 10-15 minutes to complete our survey. We are aiming to collect responses from researchers across different disciplines. The answers of the survey will be collected anonymously. Results from this survey will be used in the development of services to encourage and support the sharing of research software and to ensure the integrity and reproducibility of scholarly activity. The survey will be open until March 20th. If you have any question about the study or a problem accessing the survey, please contact yasminal@berkeley.edu or John.Borghi@ucop.edu. Could I re-research my first research? 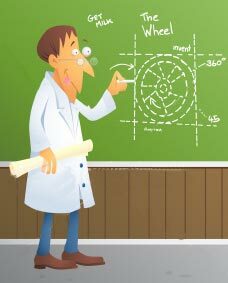 Can I re-research my first scientific paper? Last week, one of my teammates, at Old Dominion University, contacted me and asked if she could apply some of the techniques I adopted in the first paper I published during my Ph.D. She asked about the data and any scripts I had used to pre-process the data and implement the analysis. I directed her to where the data was saved along with a detailed explanation of the structure of the directories. It took me awhile to remember where I had saved the data and the scripts I had written for the analysis. At the time, I did not know about data management and the best practices to document my research. I shared the scripts I generated for pre-processing the data with my colleague, but the information I gave her did not cover all the details regarding my workflow. There were many steps I had done manually for producing the input and the output to and from the pre-processing scripts. Luckily I had generated a separate document that had the steps of the experiments I conducted to generate the graphs and tables in the paper. 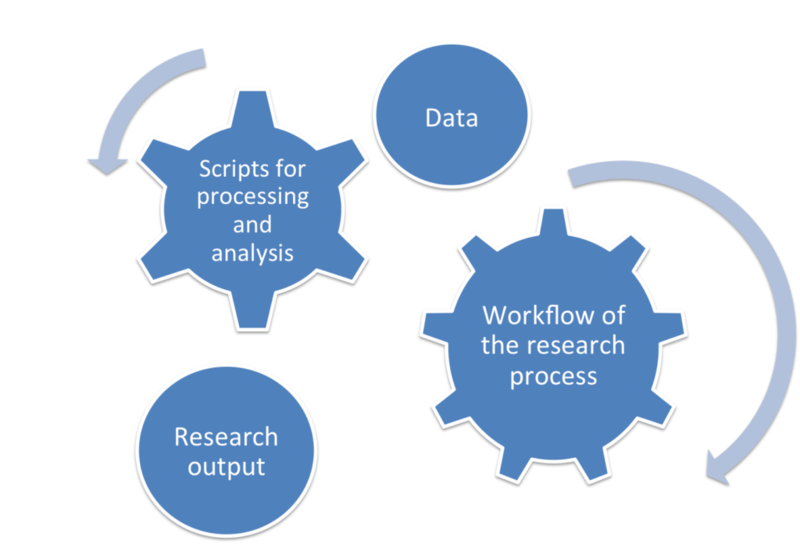 The document contained details of the research process in the paper along with a clear explanation for the input and the output of each step. When we submit a scientific paper, we get reviews back after a couple of months. That was why I documented everything I had done, so that I could easily regenerate any aspect of my paper if I needed to make any future updates. The basic entities of scientific research. Documenting the workflow and the data of my research paper during the active phase of the research saved me the trouble of trying to remember all the steps I had taken if I needed to make future updates to my research paper. Now my colleague has all the entities of my first research paper: the dataset, the output paper of my research, the scripts that generated this output, and the workflow of the research process (i.e., the steps that were required to produce this output). She can now repeat the pre-processing for the data using my code in a few minutes. Funding agencies have data management planning and data sharing mandates. Although this is important to scientific endeavors and research transparency, following good practices in managing research data and documenting the workflow of the research process is just as important. Reproducing the research is not only about storing data. It is also about the best practices to organize this data and document the experimental steps so that the data can be easily re-used and the research can be reproduced. Documenting the directory structure of the data in a file and attaching this file to the experiment directory would have saved me a lot of time. Furthermore, having a clear guidance for the workflow and documentation on how the code was built and run is an important step to making the research reproducible. While I was working on my paper, I adopted multiple well known techniques and algorithms for pre-processing the data. Unfortunately, I could not find any source codes that implemented them so I had to write new scripts for old techniques and algorithms. To advance the scientific research, researchers should be able to efficiently build upon past research and it should not be difficult for them to apply the basic tenets of scientific methods. My teammate is not supposed to re-implement the algorithms and the techniques I adopted in my research paper. It is time to change the culture of scientific computing to sustain and ensure the integrity of reproducibility. 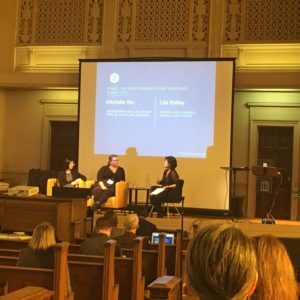 On October 26-28, I had the honor of attending the Library Leaders Forum 2016, which was held at the Internet Archive (IA). This year’s meeting was geared towards envisioning the library of 2020. October 26th was also IA’s 20th anniversary. 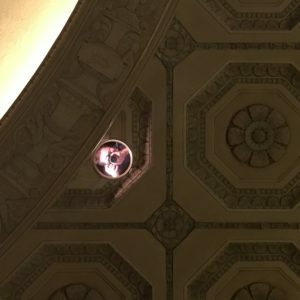 I joined my Web Science and Digital Libraries (WS-DL) Research Group in celebrating IA’s 20 years of preservation by contributing a blog post with my own personal story, which highlights a side of the importance of Web preservation for the Egyptian Revolution. More personal stories about Web archiving exist on WS-DL blog. 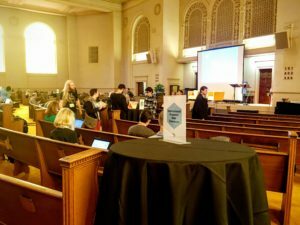 In the Great room at the Internet Archive Brewster Kahle, the Internet Archive’s Founder, kicked off the first day by welcoming the attendees. He began by highlighting the importance of openness, sharing, and collaboration for the next generation. During his speech he raised an important question, “How do we support datasets, the software that come with it, and open access materials?” According to Kahle, the advancement of digital libraries requires collaboration. The rule of 1 – Ask one question answer one question. The rule of n – If you are in a group of n people, speak 1/n of the time. Before giving the microphone to the attendees for their introductions, Hanamura gave a piece of advice, “be honest and bold and take risks“. She then informed the audience that “The Golden Floppy” award shall be given to the attendees who would share bold or honest statements. Next was our chance to get to know each other through self-introductions. We were supposed to talk about who we are, where we are from and finally, what we want from this meeting or from life itself. The challenge was to do this in four words. “Partnership is important for advancing the library system”, Sylvain Belanger. After the introductions, Sylvain Belanger, the Director of Preservation of Library and Archives in Canada, talked about where his organization will be heading in 2020. He mentioned the physical side of the work they do in Canada to show the challenges they experience. They store, preserve, and circulate over 20 million books, 3 million maps, 90,000 films, and 500 sheets of music. “We cannot do this alone!” Belanger exclaimed. He emphasized how important a partnership is to advance the library field. He mentioned that the Library and Archives in Canada is looking to enhance preservation and access as well as looking for partnerships. They would also like to introduce the idea of innovation into the mindset of their employees. 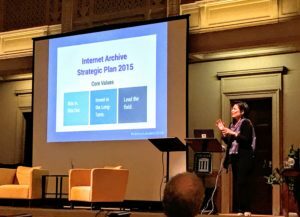 According to Belanger, the Archives’ vision for the year 2020 includes consolidating their expertise as much as they can and also getting to know how do people do their work for digitization and Web archiving. After the Belanger’s talk, we split up into groups of three to meet other people we didn’t know so that we could exchange knowledge about what we do and where we came from. Then the groups of two will join to form a group of six that will exchange their visions, challenges, and opportunities. Most of the attendees agreed on the need for growth and accessibility of digitized materials. Some of the challenges were funding, ego, power, culture, etc. Chris Edwards from the Getty Research Institute. 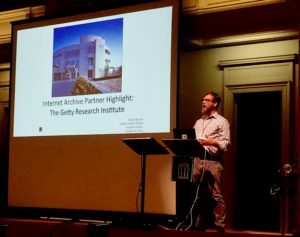 Chris Edward, the Head of Digital Services at the Getty Research Institute, talked about what they are doing, where they are going, and the impact of their partnership with the IA. Edward mentioned that the uploads by the IA are harvested by HathiTrust and the Defense Logistics Agency (DLA). This allows them to distribute their materials. Their vision for 2020 is to continue working with the IA and expanding the Getty research portal, and digitize everything they have and make it available for everyone, anywhere, all the time. They also intend on automating metadata generation (OCR, image recognition, object recognition, etc. ), making archival collections accessible, and doing 3D digitization of architectural models. They will then join forces with the International Image Interoperability Framework (IIIF) community to develop the capability to represent these objects. He also added that they want to help the people who do not have the ability to do it on their own. “No book should be digitized twice!”, this is how Wendy Hanamura ended her talk. Then we had a chance to put our hands on the new tools by the IA and by their partners through having multiple makers’ space stations. 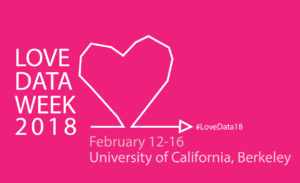 There were plenty of interesting projects, but I focused on the International Research Data Commons– by Karissa McKelvey and Max Ogden from the Dat Project. Dat is a grant-funded project, which introduces open source tools to manage, share, publish, browse, and download research datasets. Dat supports peer-to-peer distribution system, (e.g., BitTorrent). Ogden mentioned that their goal is to generate a tool for data management that is as easy as Dropbox and also has a versioning control system like GIT. After a break Jeffrey Mackie-Mason, the University Librarian of UC Berkeley, interviewed Brewster Kahle about the future of libraries and online knowledge. 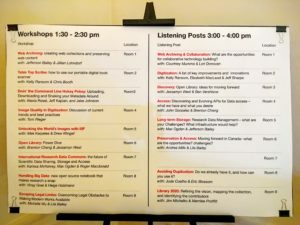 The discussion focused on many interesting issues, such as copyrights, digitization, prioritization of archiving materials, cost of preservation, avoiding duplication, accessibility and scale, IA’s plans to improve the Wayback Machine and many other important issues related to digitization and preservation. 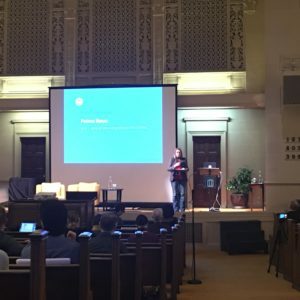 At the end of the interview, Kahle announced his white paper, which wrote entitled “Transforming Our Libraries into Digital Libraries”, and solicited feedback and suggestions from the audience. The photographer Brad Shirakawa while taking an aerial shot at the Great room. 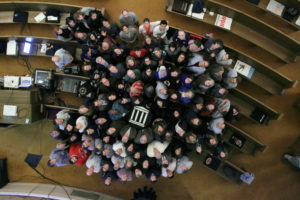 At the end of the day, we had an unusual and creative group photo by the great photographer Brad Shirakawa who climbed out on a narrow plank high above the crowd to take our picture. 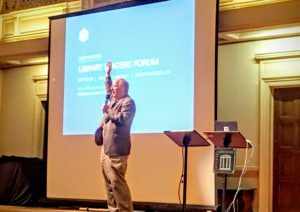 On day two the first session I attended was a keynote address by Brewster Kahle about his vision for the Internet Archive’s Library of 2020, and what that might mean for all libraries. 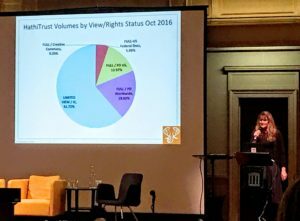 Heather Christenson, the Program Officer for HathiTrust, talked about where HeathiTrust is heading in 2020. Christenson started by briefly explaining what is HathiTrust and why HathiTrust is important for libraries. Christenson said that HathiTrust’s primary mission is preserving for print and digital collections, improving discovery and access through offering text search and bibliographic data APIs, and generating a comprehensive collection of the US federal documents. Christensen mentioned that they did a survey about their membership and found that people want them to focus on books, videos, and text materials. A panel discussion about the Legal Strategies and Practices for libraries. Tom Rieger talks about the LOC’s 2020 strategic plan. After the panel Tom Rieger, the Manager of Digitization Services Section at the Library of Congress (LOC), discussed the 2020 vision for the Library of Congress. 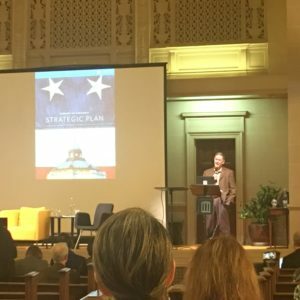 Reiger spoke of the LOC’s 2020 strategic plan. He mentioned that their primary mission is to serve the members of Congress, the people in the USA, and the researchers all over the world by providing access to collections and information that can assist them in decision making. To achieve their mission the LOC plans to collect and preserve the born digital materials and provide access to these materials, as well as providing services to people for accessing these materials. They will also migrate all the formats to an easily manageable system and will actively engage in collaboration with many different institutions to empowering the library system, and adapt new methods for fulfilling their mission. In the evening, there were different workshops about tools and APIs that IA and their partners provided. I was interested in the RDM workshop by Max Ogden and Roger Macdonald. I wanted to explore the ways we can support and integrate this project into the UC Berkeley system. I gained more information about how the DAT project worked through live demo by Ogden. We also learned about the partnership between the Dat Project and the Internet Archive to start storing scientific data and journals at scale. Notes from “Long-Term Storage for Research Data Management” session. We then formed into small groups around different topics on our field to discuss what challenges we face and generate a roadmap for the future. I joined the “Long-Term Storage for Research Data Management” group to discuss what the challenges and visions of storing research data and what should libraries and archives do to make research data more useful. We started by introducing ourselves. We had Jefferson Bailey from the Internet Archive, Max Ogden, Karissa from the DAT project, Drew Winget from Stanford libraries, Polina Ilieva from the University of California San Francisco (UCSF), and myself, Yasmin AlNoamany. The long-term storage for the data and what preservation means to researchers. 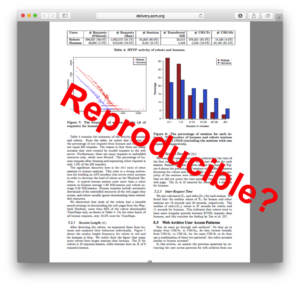 What is the threshold for reproducibility? 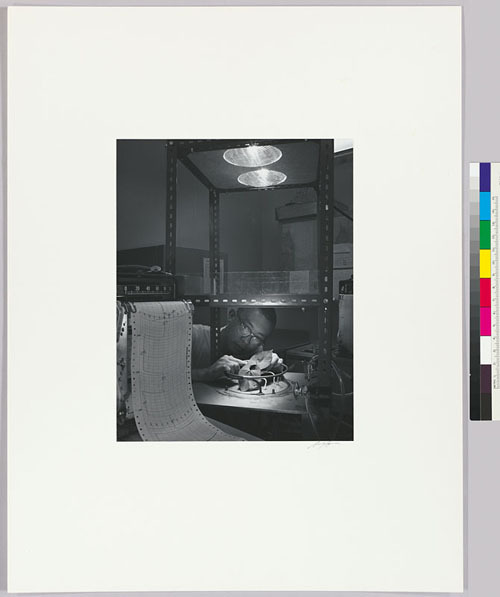 What do researchers think about preservation? Does it mean 5 years, 15 years, etc.? What is considered as a dataset? Harvard considers anything/any file that can be interpreted as a dataset. 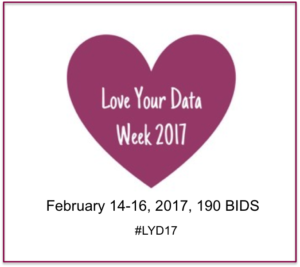 Do librarians have to understand the data to be able to preserve it? What is the difference between storage and preservation? Data can be stored, but long-term preservation needs metadata. Do we have to preserve everything? If we open it to the public to deposit their huge datasets, this may result in noise. For the huge datasets what should be preserved and what should not? Privacy and legal issues about the data. We need to teach researchers how to generate metadata and the metadata should be simple and standardized. 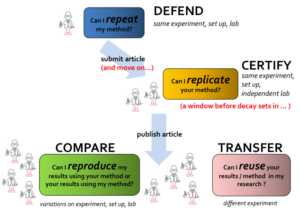 Everything that is related to research reproducibility is important to be preserved. Assigning DOIs to datasets is important. Secondary research – taking two datasets and combine them to produce something new. 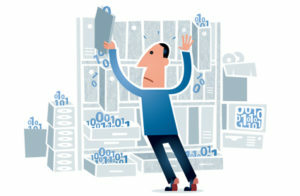 In digital humanities, many researchers use old datasets. There is a need to fix the 404 links for datasets. There is should be an easy way to share data between different institutions. Archives should have rules for the metadata that describe the dataset the researchers share. The network should be neutral. Everyone should be able to host a data. 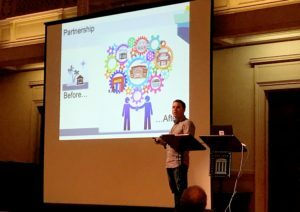 WEB ARCHIVING: What are the opportunities for collaborative technology building? Polina Ilieva from UCSF wrapped up the meeting. At the end of the day, Polina Ilieva, the Head of Archives and Special Collections at UCSF, wrapped up the meeting by giving her insight and advice. She mentioned that for accomplishing their 2020 goals and vision, there is a need to collaborate and work together. Ilieva said that the collections should be available and accessible for researchers and everyone, but there is a challenge of assessing who is using these collections and how to quantify the benefits of making these collections available. 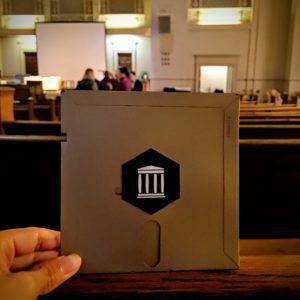 She announced that they would donate all their microfilms to the Internet Archive! “Let us all work together to build a digital library, serve users, and attract consumers. Library is not only the engine for search, but also an engine for change, let us move forward!” This is how Ilieva ended her speech. It was an amazing experience to hear about the 2020 vision of the libraries and be among all of the esteemed library leaders I have met. I returned with inspiration and enthusiasm for being a part of this mission and also ideas for collaboration to advance the library mission and serve more people.